Good reflective article by Peter Campbell on why SharePoint scares him. Scares me to but my take is that by keeping it simple, avoiding MOSS, use by teams with leaders (not individuals), it can work. I’m proving that. When I bought the new MacBook, I vowed to myself that since I was going to install and run Windows XP via VWware Fusion, I would not need to move to Microsoft’s version of Office for OS X (Office 2008) . However as time went on I grew curious about how Word and maybe Excel would be if run natively in the Mac. I downloaded and tried the demo version and was pleasantly surprised to feel that I liked writing in Word 2008 for the Mac than using Word 2007 on Windows. Word 2007 is just “too much” sometimes, but I do appreciate it’s richness of functionality. Today I discovered why Office on the Mac is a “deal”. The product lacks macros. I cannot do keystroke recording of macros. I cannot create macros. I cannot edit macros. I’m told it “respects” macros in files created by other versions of Office, e.g. Office 2003 and 2007 for Windows. But macro functionality has stripped out. Gosh. There are times that with a small macro I can do a lot to remove the drudgery of something. What a surprise. No macros in Office 2008 for the Mac. I decided to take the plunge with my new MacBook to use one of the time logging programs. I needed to be able to show my customers what time was spent; more importantly I wanted to understand where my time was going. I did my research for the possibilities with the help of Google (as you do). I tried out a few. Billings. Heard about this from Apple’s web site. The good is that’s is “pretty” and the reports look great. The bad is that the data is hostage. Can’t get it out into a database or a spreadsheet. TimeCache. From pandaware.com. This appeared interesting. It had a lot of settings and it appeared that the data could be sent from a report to a CSV file that could then be imported. It seemed like it was written by and for accountants as it used a lot of nomenclature that I found non-interesting, e.g. Posting. While it had a lot of settings and it appeared to be the one I wanted. I went ahead and bought a license key. However, after a couple weeks of use I grew less enthralled with its odd user interface (caused maybe by its Mac roots), the complexity of getting data in and out, and all that. I looked around again. OfficeTime. I can’t remember how I found this. At first glance it looked great. Less complexity than TimeCache which could be good or bad. Sometimes with complexity the software can be around for the long term since it can handle most anything. I used it in parallel with TimeCache for a few days and soon discoved that OfficeTime was just better for me. It’s now the “standard” around here. They even have a Windows version which could be useful for some business opportunities I see. Since it had only been a few weeks since I bought a license for TimeCache, I wrote them and asked for refund, explaining why I wasn’t going to use it anymore. I got back a snotty email from them about how they had a problem with that since I had full opportunity to test the software before buying it. True. But who would have thought to treat a customer that way. I told them to keep the fee and and I’m glad the relationship is severed. Meantime, I’m using OfficeTime. I’ve been in contact with the developers to suggest how they could do some simple integration with SharePoint to make it a more valuable product. Hopefully that happens. 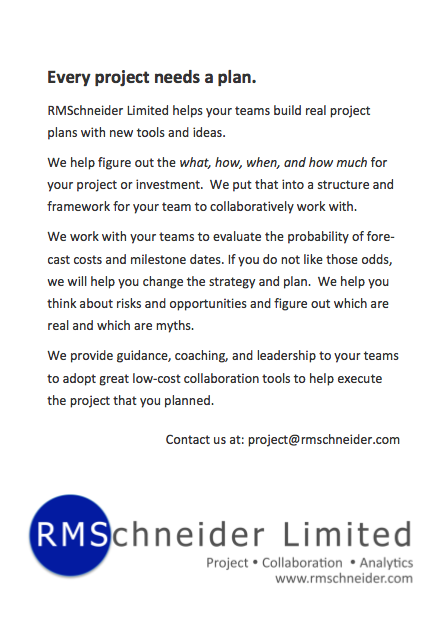 I found an opportunity to include a small advertisement in an up-coming supplement in a major UK daily newspaper “Report on Project Management”. They plan to focus on why project management is vital to every business strategy as efficiency & effectiveness is key to succeeding in a recession. Here’s what will be published. I was going for the “look” that I remember from Mobil Corporation’s ad’s on the editorial page of the New York Time from the 1980’s. In honor of the Mercury, Gemni, and ultimately the Apollo missions and people behind them, watch this video of Saturn V rocket launches. http://www.youtube.com/watch?v=2rXtG3vfAlA. The most powerful machine ever built my humanity. Last evening on UK’s Channel 4 news there was an alarming report about planned increases in charges by water companies to customers. Gosh, but they propose “9% increase from £345/year now to £375 by 2014”. You are currently browsing the Musings on Interesting Things blog archives for July, 2009.